As an Investor Confidence Project Certified Developer, FS Energy recognizes the need for standardization of energy efficiency projects – from developing the baseline to measurement and verification – which will help facilitate an increased flow of institutional funds to finance future energy efficiency projects. 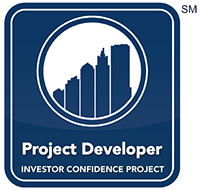 The Investor Confidence Project is enabling a marketplace for building owners, project developers, finance and energy service providers, insurers, utilities, and a growing number of public programs and utilities to trade in standardized energy efficiency projects. The NYC Carbon Challenge is an initiative that helps organizations support the city’s long-term sustainability agenda, PlaNYC, which aims to reduce emissions by 80 percent below 2005 levels by 2050. Through the Challenge, multifamily buildings, universities, hospitals, and commercial offices commit to reduce their greenhouse gas emissions by 15 to 30% over the next ten years. More than 80 properties managed by FirstService Residential, comprising a total of more than 17 million square feet, have accepted this challenge – the largest participation by any residential property management company in New York City. Click here for a copy of the NYC Carbon Challenge Handbook for Co-ops and Condos.